John Coe has been an everyday, four-season bike commuter in a four-season town for almost 20 years. 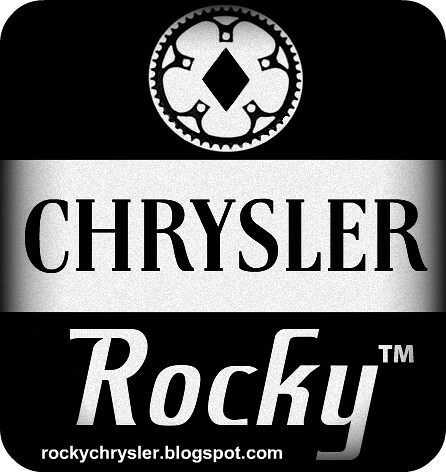 He blogs, when he blogs, mostly about bikes and skis and stuff at rockychrysler.blogspot.com. The Little Red Bike Trailer by Dayworks, Inc.
It’s the rare bike accessory that’s made almost entirely out of wood. Wooden tubular road wheels are still handmade for purists, though at several hundreds bucks a wheel, they’re priced at the most premium of points and are thus the domain of only the most serious connoisseur. 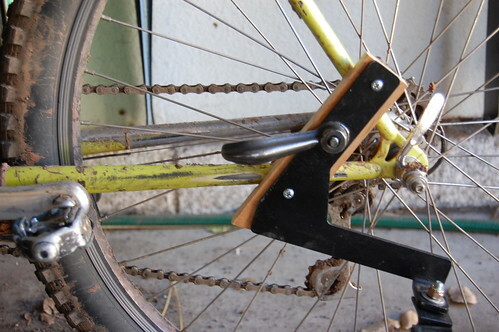 Of course, one can still buy sensible and attractive real-wood bike fenders to dress up even the most-drab commuter. 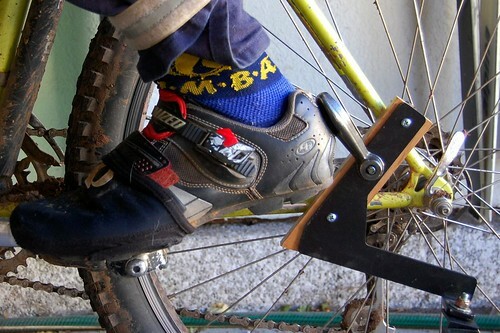 And, not surprisingly, there are even a few oddballs around who are making curious-looking bike frames out of wood. But typically, bikes and things wooden are, at best, an uneasy and uncommon mixture. 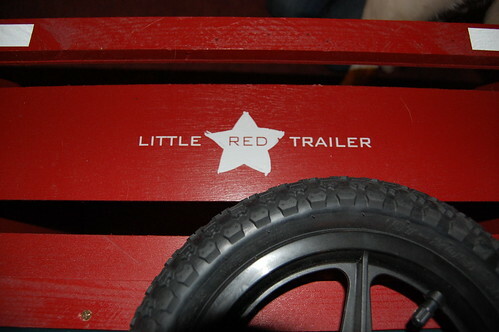 Not so for the Little Red Trailer, a handy and inexpensive (MSRP: $86.00) little bicycle utility trailer made almost entirely out of recycled wood by Dayworks, Inc. of Minneapolis, Minnesota. The Little Red Trailer, despite it’s cute-ish name, arrived packed flat in a gigantic cardboard box, and, while not heavy, it possessed an awkwardness all it’s own, sized somewhere just shy of and generally more square-shaped than a standard bike box, but without the convenient hand-slots. Likewise, despite it’s novel use of recycled wood, paint-remnants, and a few other scavenged materials, the Little Red Trailer nevertheless came packed tight in gobs of Earth-hating polystyrene packing foam and plastic. Green-contradictions notwithstanding, and aside from a few loose screws scattered unbagged in the shipping box, the Little Red Trailer’s parts-kit appeared to be complete and generally unscathed from transit. 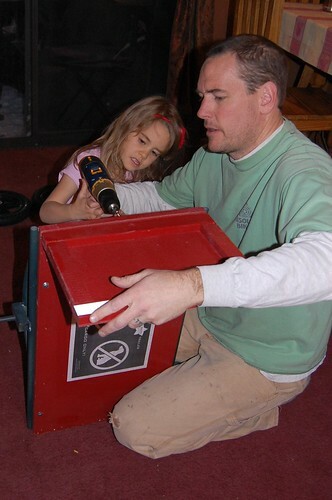 A quick glance at the simple four-page instruction booklet, with our cordless drill, a pair of pliers, and a box-end wrench in-hand, my five-year-old daughter and I were ready to begin the simple (and entertaining) process of screwing the rig’s wooden box together. 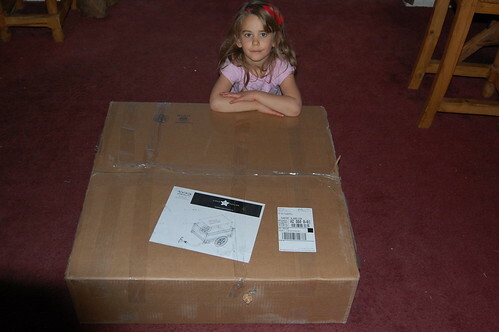 After cottering the plastic wheels onto the axles, bolting the old-style Burley-esque arm into place, and checking the pre-assembled hitch-assembly and frame bolts for snugness, we were done and gazing proudly upon a brand-new, daddy-daughter-built Little Red Trailer sitting in the middle of our living room. All-told, box-to-built, we were done in well under an hour. 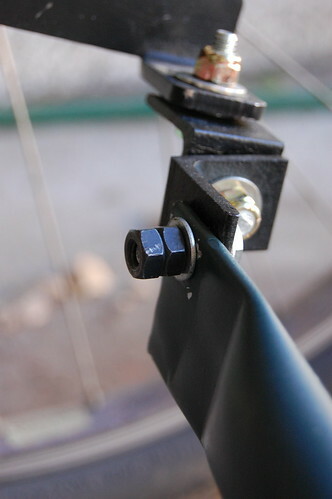 It was, to say the very least, unlike any bike-trailer-hitch I’d ever seen and, to be honest, the cause of some concern–concern that was not misplaced, I might add. The Little Red Trailer weighs a respectable 22 pounds empty. 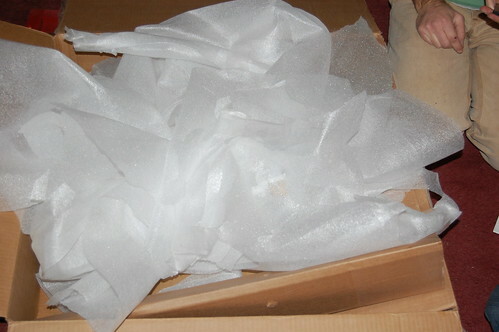 And, as with any trailer, my maiden voyage with it was initiated just that way: empty. All bike trailers get used empty, more or less half the time they’re being used, right? Gonna haul something home? Gotta take the trailer there empty to pick stuff up? Gonna make a delivery? Same thing applies, but in reverse. It’s a fact of trailering. And, as trailers go, you can hardly tell the Little Red Trailer’s attached when you’re hauling it around without a load. 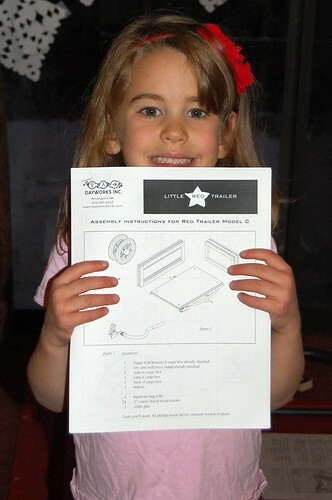 The Little Red Trailer comes with more than a few warnings–all of them printed on paper and glued to the rig. Among them is a caveat, “Trailer is ‘bouncy’ when unloaded.” By which they apparently mean, “If you’re not careful, you will find yourself dragging your empty Little Red Trailer down the road on its side.” But regardless of the less-than-descriptive wording, they’re still not kidding: It’s definitely bouncy when it’s not hauling. Very, veeeerrrry bouncy. 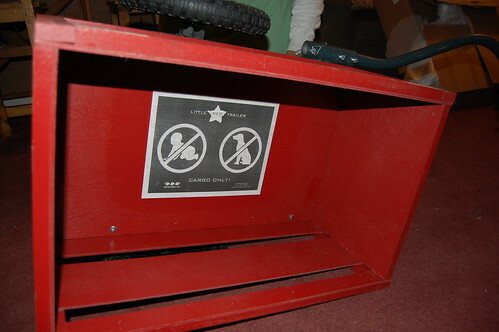 I was compelled to recall the aforementioned warning while out on my maiden voyage with the Little Red Trailer. ‘Tis true: the Little Red Trailer does not tow well at all when being dragged on its side. However, when loaded the Little Red Trailer is well-balanced, capable hauler, especially considering its cost. It’s roomy compartment (approximately 3750 square inches) and tig-welded MIG-welded tubular steel frame provide ample space and strength to haul almost anything bike-able up to (and let’s be honest, probably beyond) its impressive recommended 80 pound weight-limit. The Little Red Trailer’s hitch, however, gave me at least one moment of concern during my test riding. Heading home one evening, while coasting casually down a short hill, I noted a strange noise overtaking me on my left as I approached a red light at an intersection. I turned in the direction of the odd sound just in time to see my empty trailer pass me as it headed independently across two lanes of traffic and into the oncoming traffic lane. Fortunately, I was able to intercept the runaway trailer a few moments later, and traffic was light at this time of night, or I might not have a Little Red Trailer anymore. As I towed it by hand to the far side of the street I noted one of the Nylock nuts on the hitch was missing. Unable to get it home without a working hitch, I tossed it upside down into the ditch beside the road and rode home without it. I returned to get it later with our car. I replaced the missing Nylock nuts with two standard nuts and haven’t had any additional problems. But I check all those nuts to make sure they’re snug on a regular basis now. Otherwise, my concerns about this useful little trailer’s design are minimal. 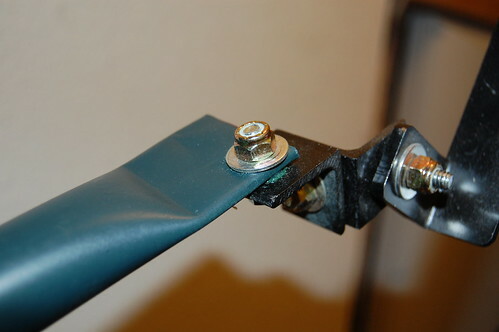 Among them: I think the potential for heel-clearance problems could become an issue; it’s easy to bump it, especially when the fastening-handle is in the wrong place. Also, I’m beginning see some cracking that’s occurring on the hardwood block where it mounts to the chain stay. And, finally, I think that the black paint on the metal frame scratches off way-too-easily; after only a few weeks of testing (and one ghost-ride across traffic) the trailer’s already looking pretty beat-up. 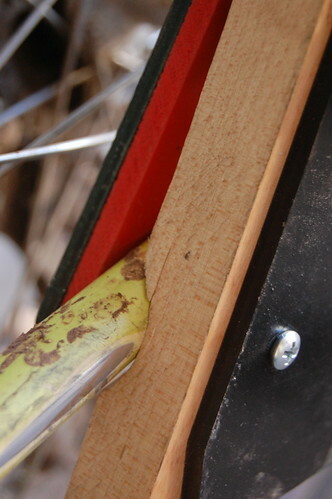 One of the coolest things about a trailer made out of wood is that it’s super-easy to modify. During my testing, while I was almost always pleased with the Little Red Trailer’s capability and size, I often found myself concerned with load-stability. Dayworks does sell a few extras that should provide some load-security, including a liner and a cover, but none of these were provided to me for this test. 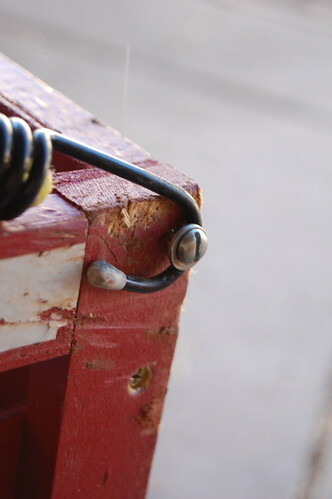 So, in order to secure my own loads I installed screws into the corners of the Little Red Trailer so that I could use my handy B.O.B. trailer bungee to “tarp” my loads on top. 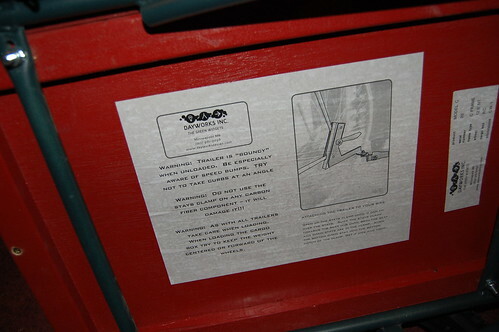 Similarly, I installed a couple brackets, one on each side of the interior of the trailer, so that I could use short tie-downs to keep loads from sliding around while in-transit on my town’s bumpy streets. Both of these mods took minutes to install, but both have proven to be useful adaptations to an otherwise generally well-thought-out hauling rig. All-in-all, I’m pretty stoked on the Little Red Trailer. It’s super-affordable, easy to assemble, generally well-built, and quite capable as a mid-sized load-hauler, though more than a bit bouncy when empty. And it’s cool that it’s made of recycled wood: good for the planet, plus it’s fun and simple to mod, too. The arguably clever-looking hitch assembly really should be a little bit more bomber, but with a little regular maintenance (such as checking the nuts and bolts for tightness regularly) it’s an acceptable concession, I think, particularly when considering the rig’s price. 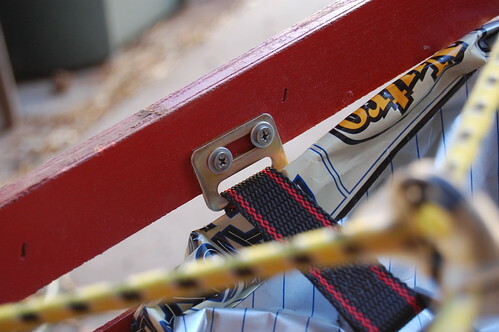 However, a retainer-strap to guard against run-away trailers would not be an inappropriate upgrade. Might have to fashion one myself. More pictures of the building and test-riding process can be viewed here.